I have an awesome and rather hilariously named Star Kins from their new collection to show you today! I was lucky enough to get Beat It Like It Owes You Money as a gift from my friend Serra (Peacock Pie) for our Polish Elves exchange at Christmas time - thank you, Serra! I got this a bit earlier than the collection released, but looking at Ami from Star Kin's swatches on the Etsy listing, it looks like no changes have been made. 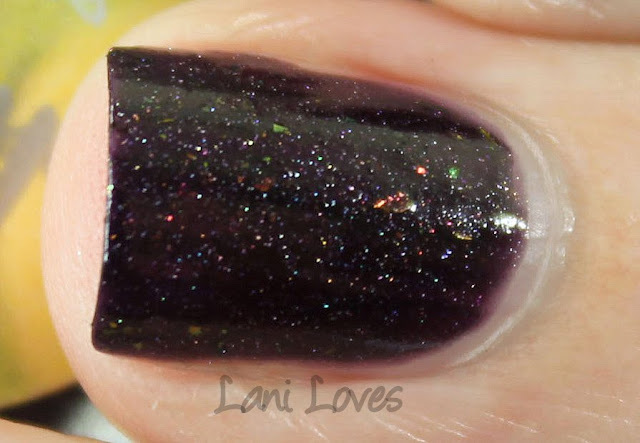 Beat It Like It Owes You Money is a luscious vampy plummy purple with holo shimmer and colour shifting flakies. It built up easily in two coats and dried smoothly with ample shine.